The House of York had won. The Lancastrian claimants to the throne were all dead, and the Yorkist Edward V was King of England, with two young sons to carry on his legacy. The Wars of the Roses finally seemed to be over. But of course, this is the game of thrones we’re talking about—endings that clean are rare. The roses were not quite laid to rest just yet. 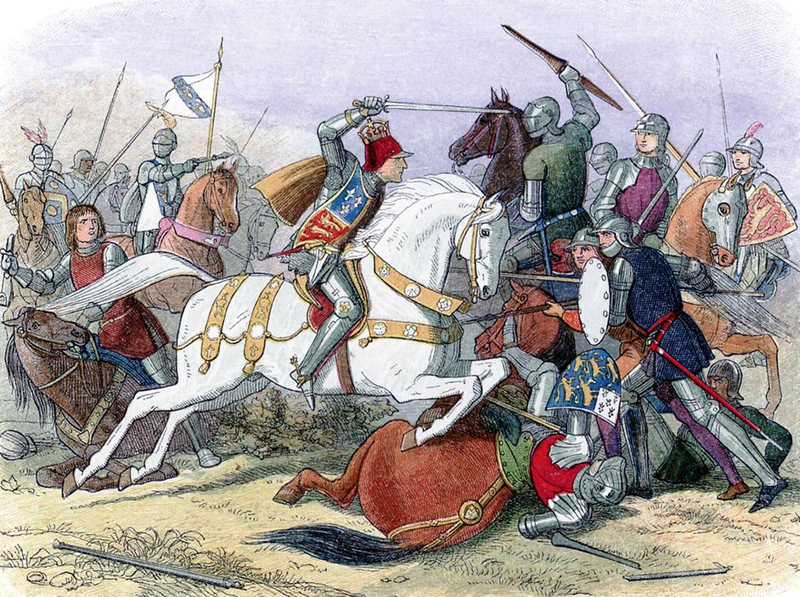 There was plenty more intrigue in store, and it would all culminate at Bosworth Field, the pitched battle which saw one king cut down, and another one crowned, all before the day was out. Edward IV was king. Son of Richard, the Third Duke of York, Edward had reaped the spoils of his father’s efforts in the war to become king after the feeble, Lancastrian Henry VI was finally deposed. Though his rule was challenged in 1470, he defeated the Lancastrians once and for all at Tewksbury and reclaimed his throne in 1471. As King, he attainted any nobles who refused to acknowledge him as their king, including a man named Jasper Tudor and his nephew Henry. The Tudors were technically the sole remaining Lancastrian nobles that had any possible claim to the throne, but they were of little concern to the king. After Edward labeled them as traitors and took their land, their influence in England seemed completely dead. They fled across the English Channel and ended up in Brittany. It was written that Edward saw Henry as a nobody—his lands and reputation were gone, and his connection to the throne was distant at best. However, the Duke of Brittany thought Henry might be useful, and kept the Tudors under his protection. If he’d known what was to come, Edward just might have given this particular nobody a little more of his attention. For the final 12 years of his reign, Edward IV actually managed to rule in relative peace, and with his young sons Edward and Richard waiting in the wings, the House of York seemed poised to begin a long dynasty on England’s throne. But a sudden illness threw that fact into doubt. Though he was only in his late 30s, Edward’s health began to decline in his final years, before he fell ill for the last time in 1483. 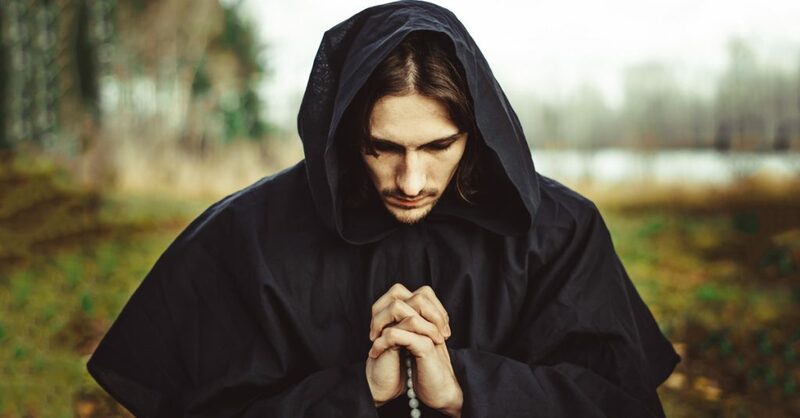 After putting his affairs in order—which included making his brother Richard England’s Lord Protector until his son came of age—he died on April 9, 1483 at just 40 years old. The first Yorkist king was dead, but at least here were plenty of men left in his family to keep the House in power. Right? 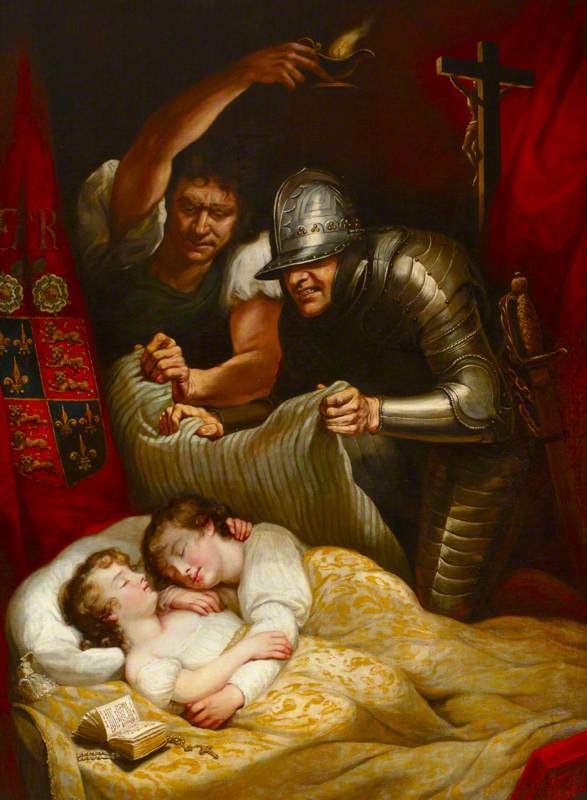 Edward intended for his son, the 12-year-old Edward V of England, to be crowned king after his death, but his brother Richard had other things in mind. Immediately upon Edward IV’s death, Richard took advantage of concerns that the Woodvilles, the family of Edward’s widow, were looking to control the young king and dominate England. Richard had the young king-to-be brought to the Tower of London for his protection, and had two of the Woodvilles executed for treason without a trial. Young Edward’s brother, Richard of Shrewsbury, was brought to join him in the Tower soon after. However, uncle Richard had no intention of protecting his nephews. Once they were brought into the infamous castle, they were never seen again. Meanwhile, Richard had his brother Edward IV’s marriage to their mother declared illegal. This may seem like an odd maneuver, but it accomplished something very important to Richard: it made the two young princes illegitimate, and thus not eligible for England’s throne. So, who did that leave next in line? I think you know the answer. Richard III was crowned two months after his brother’s sudden death. This was a man who simply could not be kept from the throne, and he tore down anyone in his path to get there—including his young nephews, who were forever more known as the Princes in the Tower. But while Richard was king, the sheer audacity of the way he’d claimed the crown for himself didn’t sit well with everybody, and there was widespread sympathy for the two missing Princes. Conspiracies against the throne emerged, and the Yorkist throne that had seemed so secure just months earlier now felt far more tenuous. After some failed uprisings against Richard, many of the King’s remaining enemies fled across the English Channel to Brittany, where they rallied around none other than Henry Tudor, the forgotten nobody with a weak but viable claim to the throne. 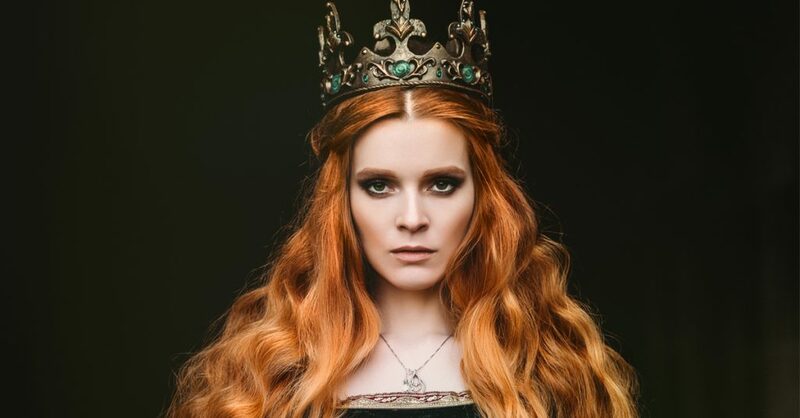 By Christmas in 1483, the year that Richard was crowned, Tudor made his claim tangible with an oath: He promised to marry the late Edward IV’s daughter, Elizabeth of York, finally uniting the warring Lancaster and York families. Especially amongst those who opposed Richard, this seemed like a perfect outcome to the Wars of the Roses, and Richard suddenly had a genuine threat to his rule. However, Richard was nothing if not cunning. He threw a wrench in Tudor’s plans in 1485 when he announced that he would marry Elizabeth of York—never mind the fact that she was his niece. This declaration threw the country into an uproar on many fronts. Not only would the marriage be incestuous, but Richard’s wife, Anne Neville, had only just died, leading to widespread rumors that Richard had her killed for the purposes of his political maneuvering. Richard’s plan to marry his niece upset many on his side, but it nonetheless represented a real threat to Tudor’s plans. Without his marriage to Elizabeth, he could easily lose the support of the families who backed him out of their allegiance to Edward IV. Things had clearly reached a boiling point, and it was time to take action. Henry put together an army and set sail for England, a country that he had never even visited—he’d spent the first 14 years of his life in Wales and the rest of it in Brittany and France. His unfamiliarity didn’t stop him—he had his sights set on the throne. 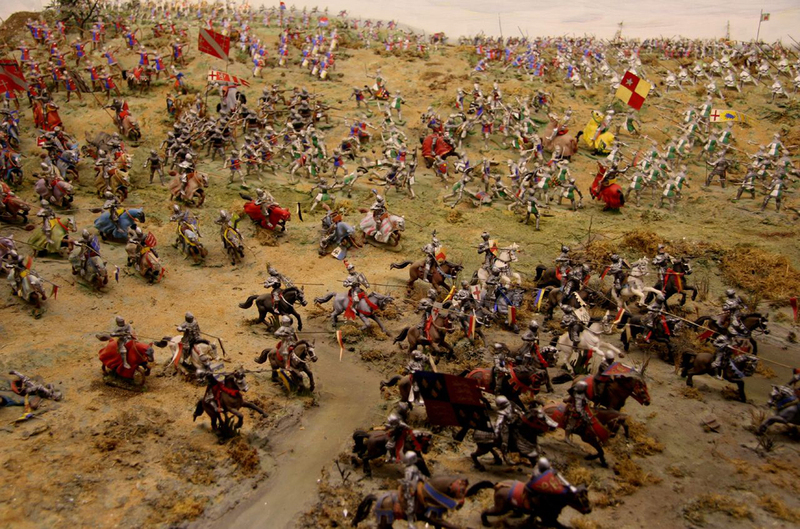 This brings us to August 22, 1485, at Bosworth Field. Three armies were laid out before each other. The largest by far were under King Richard III’s banners, numbering between 7,500 and 12,000 men. They faced down the smaller force, likely between 5,000 and 8,000 men, of Henry Tudor, while a third force loomed off to the side, on top of Dadlington Hill. This army, another 4,000 to 6,000 men, was an enormous question mark looming over the day. 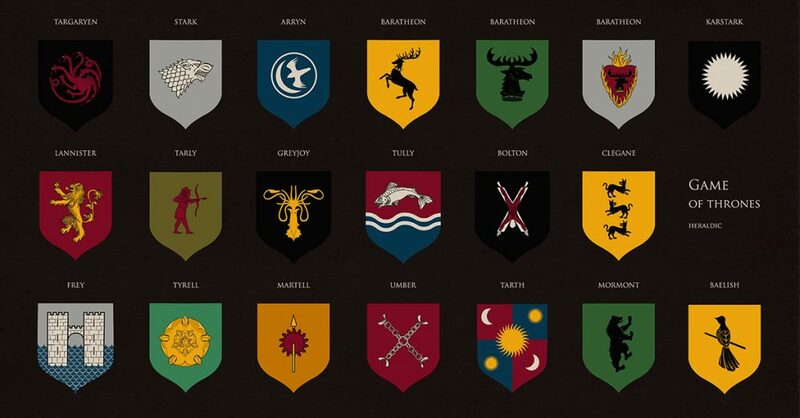 The third set of banners that day belonged to the Stanley family, who had not yet declared where their allegiances lay. Their patriarch, Thomas Stanley, had served Henry VI, Edward IV and Richard III, having played all sides throughout the Wars of the Roses. Richard had attempted to secure his support by kidnapping his son, Lord Strange, but as of yet, neither Richard nor Henry could confidently say Stanley would come to their aid. Richard’s army was divided into three sections, one led by the Duke of Norfolk, one by the Earl of Northumberland, and a smaller force led by Richard himself. But while Richard was an accomplished warrior, Henry Tudor was a stranger to the arts of war. Though he personally attended the battle, he left the command of his forces to the Earl of Oxford, an experienced veteran. Of all the commanders on the field that day, Oxford moved first. Leaving Tudor behind with a small bodyguard, Oxford had his men engage with Norfolk’s forces, and it wasn’t long before the battle was going Oxford’s way. Richard knew he needed to act, but this is where things started to fall apart. First, he sent an ultimatum to Stanley up on the hill: support me now, or your son’s life is forfeit. Unmoved, Stanley simply sent the reply “Sire, I have other sons.” The third army stayed firmly on the sidelines. Richard also commanded that Northumberland’s men move against Oxford. His army still vastly outnumbered the Tudor men, and it should have been cut and dry. Yet, Northumberland’s forces stayed put. No one truly knows why this is. It could be that his men were stuck in the marshy ground, or maybe that he’d secretly made a deal with Tudor, but regardless of the reason, one thing is for sure: Northumberland’s men did not come to Norfolk’s aid. The king was running out of options when he saw an opportunity. When Oxford had taken the army to attack Norfolk, Henry himself had been left exposed. With the battle getting away from him, Richard figured that his best chance at victory was to cut the head off of the snake. He took a small group of heavy cavalry and personally charged directly at Tudor and his bodyguard. Henry Tudor was no warrior, but Richard had seen many battles throughout the Wars of the Roses, and he was out for blood. It appeared that Bosworth Field was going to be determined in a skirmish between the two actual men that were vying for the crown. Richard fought with a wild abandon. He killed Henry’s standard-bearer, Sir William Brandon, in his initial charge. He unhorsed his brother’s old standard-bearer, the imposing John Cheyne, striking him in the head with a broken lance. Henry’s bodyguard was not prepared for such a sudden and vicious attack. Henry himself got off his horse and attempted to blend in amongst his men so he would be less obvious of a target. Richard fought on, and he even managed to get within a swords-length of his rival, the helpless Henry Tudor. But Henry’s bodyguard managed to keep the warrior-king at bay until disaster struck for Richard and the House of York. Lord Stanley had finally decided to make his move, and he’d thrown in his lot with Tudor. Richard had been so close to his goal, but once Stanley played his hand, all hope was lost. Richard’s men were pushed back several hundred yards and several of them outright abandoned the fight, but Richard himself fought on. Even after his horse had tumbled into the marsh and thrown him to the ground, the king fought on. Reports of that day say that he cried “God forbid that I retreat one step. I will either win the battle as a king, or die as one.” In these final, frantic moments, Richard’s own standard-bearer lost his legs in the fighting but still managed to hold the House of York’s banner aloft until the very end. But it, like Richard, would eventually fall. Richard III was finally cut down in the fray. Different accounts exist as to who delivered the final blow, but it was said to be so brutal that Richard’s helmet was driven into his skull. 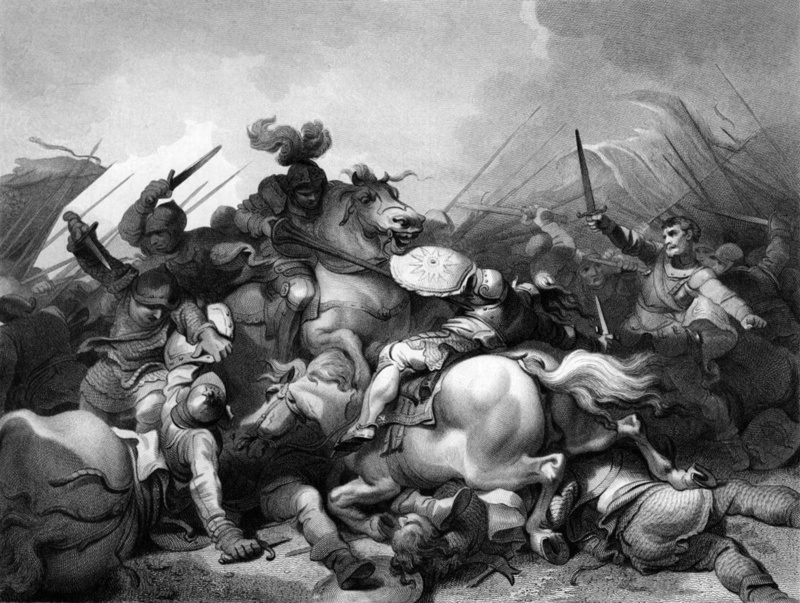 There were still thousands of men on the battlefield, but the king’s death signaled the battle’s end. His forces completely fell apart and retreated. It was done. Allegedly, Lord Stanley himself managed to find Richard’s circlet and brought it to Henry Tudor. He was proclaimed king and crowned beneath an oak tree near the field where the battle had been fought. Thus ended the Wars of the Roses. The white roses of York and the red roses of Lancaster had spent decades vying for the crown, and yet, neither side truly won. In the end, it was the red and white rose of Tudor that held England’s crown, creating a dynasty which would see some of the most powerful monarchs in the history of the British Isles. Quiz: How Much Do You Know About The Great Genghis Khan?